The Skinny: Stephen Chow turns in his finest performance in the second Monkey King epic, which is uneven (like most Jeff Lau films) but also hilarious and even affecting. When we last left Joker (Stephen Chow), he’d just used the Pandora’s Box to go back in time five hundred years, finding himself in the company of Zixia the immortal (Athena Chu). Zixia steals the box from Joker and then makes his life hell by playing “Cybil” with him; she switches personalities between herself and her sister, who hates Zixia. As if that weren't bad enough, Joker wants to go back to the future to find his wife (Karen Mok, who he married in Part 1), because bad things were happening before he time jumped. But no go. He’s stuck with Zixia until he runs into all sorts of strange and weird characters including his old master, the Longevity Monk (Law Kar-Ying). 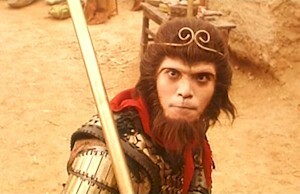 Now he can regain his Monkey King form and complete his quest, except he must cast off all human desire, which is harder than it sounds when Athena Chu is throwing herself at you. image courtesy of Mei Ah Laser Disc Co., Ltd.